It may be behind a small panel on the front, or you may need to unscrew the entire lower panel of your washing machine. Consult your manual if you’re not sure. You’ll want to have a pan to catch water and/or several towels. Newer models have a small hose for draining water, older models will gush out around the seal as you slowly unscrew the filter. You may be able to find a youtube video for doing this specifically on your washer. 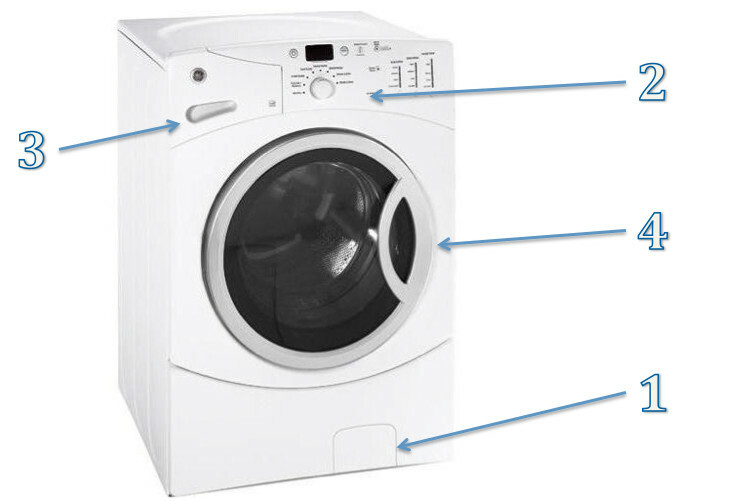 This should be done monthly, or any time your washer has trouble draining water or throws an error code related to draining. Or when a sock has gone missing that you know went in the washer. See examples in the appendix. You should be wiping these down regularly after every load or so, and leaving the door open to prevent mildew, but once a month or so, wipe down the door seal with a strong disinfecting cleaner. You probably want to use gloves for this part. Carefully combine 3⁄4 cup (177 mL) of liquid chlorine bleach with 1 gallon (3.8 L) of warm tap water. Wipe the seal/bellow area with the dilute solution using a damp cloth. Wipe down the area thoroughly with a dry cloth and let the washer interior air dry with the door open. Clean the detergent dispenser to remove laundry additive buildup. This should be done quarterly or any time you see buildup or loss of function. Consult your manual for your model specific details. A dedicated cleaning cycle with 1/2 cup of at least 5.25 sodium hypochlorite bleach. In the machine below, the entire lower panel had to be removed. There is no hose to let it drain, so the water will gush out around the seal and threads as you unscrew the filter. Place a large shallow pan, a lot of towels, and/or a shop vac nozzle under the screw cap and turn slowly to release the water. Don’t try to remove the filter until the water stops flowing out. The machine below has an easy access front panel and drain tube. Before unscrewing the filter, unhook the drain tube on the left, place it in a shallow basin, and uncap it. When the water stops draining, recap and re-hook the drain tube, then place a towel under the filter and unscrew to remove it.